NEW YORK - Oil prices fell on Friday after the Organization the Petroleum Exporting Countries announced plans to maintain production near record highs despite depressed prices, as the producer group continued to guard its share of an oversupplied market. OPEC's Secretary General Abdullah al-Badri said the group was unable to agree on a production ceiling, in part because it was unclear how much oil Iran would export next year when sanctions are lifted. The lack of consensus apparently allowed member countries to continue pumping oil at current rates into a glutted global market. Friday's announcement sent ripples through wider markets, but losses in oil futures were limited as prices hit key support levels around $40 a barrel. Brent crude oil futures fell 58 cents to $43.26 a barrel by 12:11 p.m. ET after rising in early trade. The benchmark was within cents of August's 6-1/2-year trough. U.S. crude futures dropped over 2 percent, or 98 cents, to $40.10 after briefly dropping below $40. "There was some short covering before the announcement in case there was a production cut. When we found out that wasn’t the case, we gave up the gains," said Gene McGillian, analyst at Tradition Energy in New York. "It shifted the market back to fears of oversupply." Maintaining production would be a victory for Saudi Arabia which has been under pressure from OPEC's poorer members to cut output to bolster prices. Oil has dropped from over $100 a barrel since June 2014 as a global glut weighs on prices. Saudi Arabia has been content to keep production up, a move which has squeezed non-OPEC producers, including the United States, that have struggled to maintain profits in the face of low prices. Sources earlier told Reuters that OPEC decided to increase its collective output ceiling to 31.5 million barrels per day (bpd) from the previous 30 million bpd in a move that acknowledged that members are already pumping well in excess of the current ceiling. 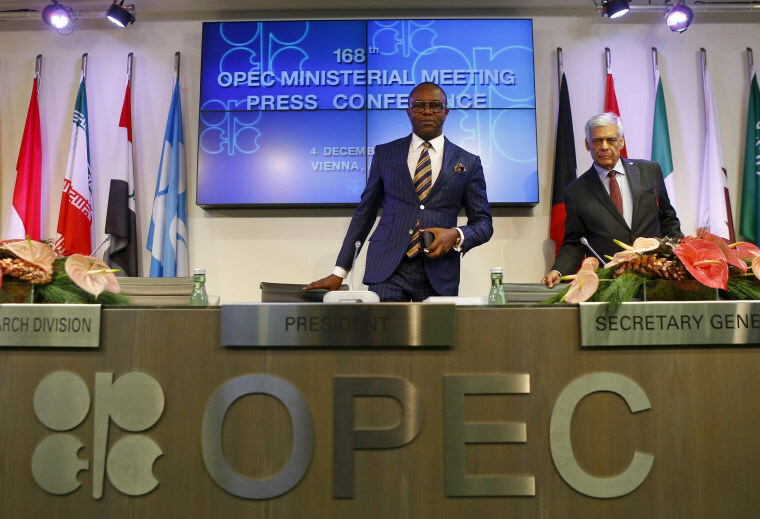 But OPEC did not mention a ceiling in its official announcement. "Trading longer-term market share against short-term revenues is a hazardous policy, but once started it needs to be followed through to the end," said Paul Horsnell, head of commodities research at Standard Chartered. "That's the argument that has carried the day in OPEC, and the heavy pressure on non-OPEC producers, especially U.S. shale, is going to be kept up." Energy company shares, including those of U.S. oil major Exxon Mobil Corp. and oil service companies Baker Hughes Inc. and Halliburton Co fell after the OPEC news. The S&P Energy index fell more than 1 percent, helping cap gains in the wider stock market.